Browse: Home / Design, Food / Peeps! Peeps! Peeps! Have you ever noticed that multiples of almost anything makes for good design? Look at any of those Target ads where toilet paper and cleaning products multiply and form patterns conveying the idea that you go to Target for hip design (oh and cleaning products too). Repetition elevates the mundane into something more. Take the Peep. On it’s own, the solitary Peep is just a strange-shaped marshmellow dyed an extremely unnatural shade of fluorescent yellow… not particularly appealing to the eye or the tastebuds. 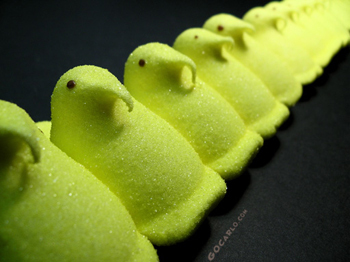 But put a bunch of Peeps in a row and suddenly they are irresistable. You don’t necessarily want to eat them… but who DOESN’T love them! It seems that posts about Peeps online are multiplying as quickly as the little guys themselves. Check out Unlikely Words for everything you ever wanted to know about the Peep.